Julien is cross-appointed to the Litigation Department and the Insolvency & Restructuring Group. His practice is diversified and includes commercial, administrative and constitutional litigation, investigations as well as corporate restructuring and insolvency proceedings for both debtors and creditors. Julien has appeared before every level of court in Canada. 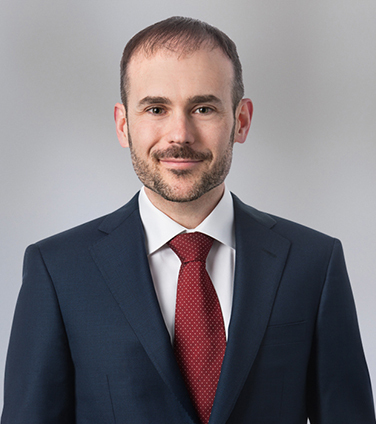 Prior to joining the firm, Julien was a law clerk to the Honourable Marie Deschamps and the Honourable Thomas Albert Cromwell, Justices of the Supreme Court of Canada. During his studies, he received numerous awards including the Elizabeth Torrance Gold Medal of McGill University’s Faculty of Law. The Stars Group Inc. (formerly Amaya Inc.) in an investigation of the Autorité des marchés financiers into allegation relating to trading of Amaya shares prior to the announcement of the US$4.9 billion acquisition of Oldford Group Ltd., owner of PokerStars and Full Tilt Poker. Homburg Invest Inc. and related companies in their restructuring under the Companies’ Creditors Arrangement Act and related litigation. The Canadian Civil Liberties Association in its intervention before the Supreme Court of Canada in the case of Gilles Doré v. Pierre Bernard in his capacity as Assistant Syndic of the Barreau du Québec, et al. dealing with freedom of expression and professional regulation issues. Imperial Tobacco Canada Ltd. in the court-supervised liquidation of Kansa General International Insurance Co. The Association of Suburban Municipalities of the Island of Montréal in proceedings for judicial review of a decision of the Agglomeration of Montréal. Laurentian Bank of Canada in various restructuring matters. Cogeco Inc. in its successful defence of a decision of the Canadian Radio-television and Telecommunications Commission before the Federal Court of Appeal. PricewaterhouseCoopers Inc. in its capacity as interim receiver to the Canadian assets of Georges Marciano. ThyssenKrupp Budd Company in defence of a product liability action in the Superior Court of Québec. KPMG Inc. in its capacity as court-appointed Monitor in the proceedings of ProSep Inc. under the Companies’ Creditors Arrangement Act. Shoppers Drug Mart Inc., Pharmaprix Inc. and Sanis Health Inc. regarding regulatory matters. Corbeil Électrique Inc., in connection with the sale of substantially all of its business and assets to AM-CAM Électroménagers Inc. under the Companies’ Creditors Arrangement Act. “Responsabilité des administrateurs” [Director Liability], chapter 19, JurisClasseur Québec – Faillite, insolvabilité et restructuration, LexisNexis, 2010, updated annually (with Sandra Abitan). “Législation déléguée” [Delegated Legislation], chapter 4, JurisClasseur Québec – Droit administratif, LexisNexis, 2013, updated annually (with the Honourable Sylvain Lussier). Contributing author to the LexisNexis Practice Advisor Canada Insolvency & Restructuring module. “Une vérification tourne mal : l’Agence du revenu du Québec condamnée à verser plus de 4 millions de dollars en dommages-intérêts” (english abstract published under the title “When an audit goes bad: Quebec Revenue Agency ordered to pay over $4M in damages”), National Tax Insights, March 2014 (with Julia Wang). “Punitive damages against Revenu Québec”, (2014) 22 Can. Tax Highlights 1 (with Julia Wang). “Superior Court of Quebec refuses to apply Indalex”, (2012) 24 Comm. Insol. R. 58 (with Martin Desrosiers and Sandra Abitan). “We Can Bankrupt the Company for Sure, It’s Insolvent – Think Again”, post on the Weil Bankruptcy Blog (North of the Border Update), March 30, 2015 (with Martin Desrosiers), as well as in the Commercial Insolvency Report (Vol. 27, No. 6, August 2015). “Rare Substantive Consolidation Order Issued by Ontario Court”, post on the Weil Bankruptcy Blog (North of the Border Update), January 5, 2015. “Who Gets the Upside in a Single-Asset Real Estate Company? Unsecured Creditors, Québec Court Rules”, post on the Weil Bankruptcy Blog (North of the Border Update), April 29, 2014. “Court Terminates Director’s Charge and Refuses to Grant All-Encompassing Releases to Monitor and CRO”, post on the Weil Bankruptcy Blog (North of the Border Update), February 18, 2014 (with Sandra Abitan). “Avoiding Chaos: Court Uses the CCAA as Gap-Filling Regime”, post on the Weil Bankruptcy Blog (North of the Border Update), October 28, 2013 (with Martin Desrosiers). “Interim Receiver Authorized to Borrow to Fund Debtor’s Operations”, post on the Weil Bankruptcy Blog (North of the Border Update), September 3, 2013 (with Sandra Abitan). “Court-Approved Asset Sales: Does the Long Arm of the Court Have Any Grip on the Purchaser Post-Closing?”, post on the Weil Bankruptcy Blog (North of the Border Update), August 19, 2013. “Can an Insolvency Court Revive a Terminated Contract?”, post on the Weil Bankruptcy Blog (North of the Border Update), May 28, 2013 (with Martin Desrosiers). “Can Management be Replaced with a Court-Appointed Monitor? A New Brunswick Court (Surprisingly) Says No”, post on the Weil Bankruptcy Blog (North of the Border Update), March 18, 2013 (with Sandra Abitan). “Is it Wrongful to Pay a Dividend While Facing Litigation? A Québec Court May Answer”, post on the Weil Bankruptcy Blog (North of the Border Update), January 22, 2013 (with Martin Desrosiers). “Government Ordered to Pay Full Cost of Unsuccessful Claim as Creditor”, post on the Weil Bankruptcy Blog (North of the Border Update), November 19, 2012 (with Sandra Abitan). “Québec’s Legislated Marshalling and Its Unclear Ramifications”, post on the Weil Bankruptcy Blog (North of the Border Update), September 24, 2012 (with Martin Desrosiers).